A film by Saki Mafundikwa. Saki Mafundikwa’s Shungu, The Resilience of a People (2009). Northern-most academic premiere at MCAD, April 8, 1:00PM. Thanks to contributions by Student Activities Coordinator Megan Leafblad and Design Department Chair Bernard Canniffe, we are honored and delighted to be welcoming Saki Mafundikwa to our campus next week for the ‘northern-most’ academic premiere of his inspiring film about life in contemporary Zimbabwe. Saki is the founder and director of ZIVA, the Zimbabwe Institute for Vigital Arts in Harare. ZIVA is already more than an inspiration to design educators and students worldwide, and Shungu will only extend Saki’s reputation as one of the most generous, selfless, and enlightened teachers working in our field today. Directed, filmed and movingly narrated by Saki himself, Shungu will humble and inspire. 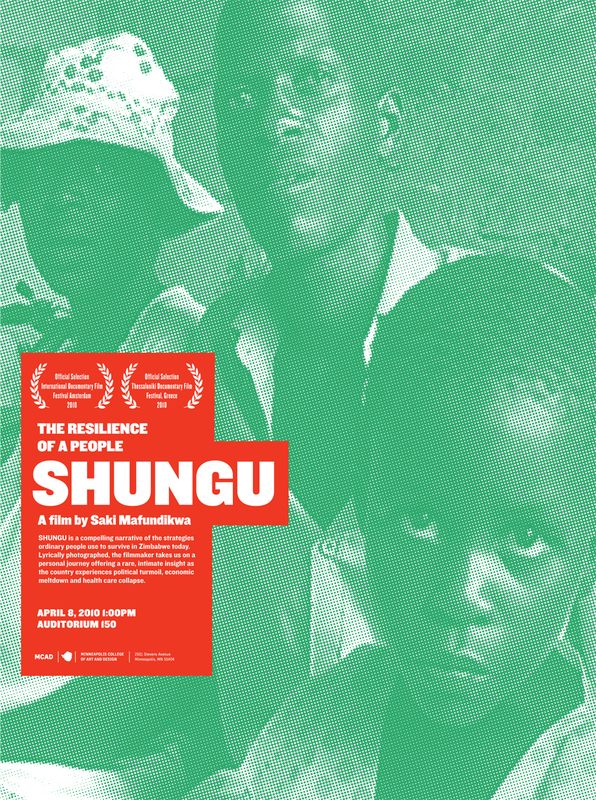 From the film’s website: “Shungu is a compelling narrative of the strategies ordinary people use to survive in Zimbabwe today. Lyrically photographed, the filmmaker takes us on a personal journey offering a rare, intimate insight as the country experiences political turmoil, economic meltdown and health care collapse. ” Shungu has premiered at the IDFA in Amsterdam, Holland (November, 2009), and recently at the Thessaloniki Documentary Festival, Greece (March, 2010). available for sale. More contact information at Shungu – The Film. All are welcome! The event is free and open to the public. MCAD April 8, 2010. Auditorium 150, 1PM. The film made it American premiere this evening at Central Michigan University. No problem, it is an amazing piece of work. You will enjoy it. The screener has truly moved our band of volunteers, we are eagerly spreading the word. Thanks so much for bringing Saki and the film to MCAD. We’re all so fortunate. I found the entire experience to be incredibly poignant. This entry was posted by Erik Brandt on Friday, April 2nd, 2010 at 4:43 PM	and is filed under Aktuell, Art, Education, Film, Geotypografika, Globalization, Graphic Design, International, Internet, MCAD, Minneapolis, Musica Viva, News Links, Typografika, Typography.